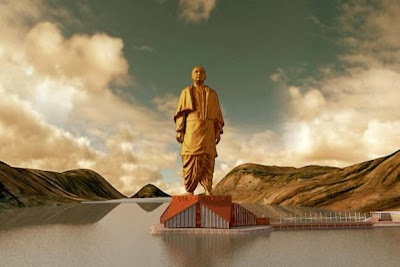 Narendra Modi, the Prime Minister aspirant, laid the foundation stone of the tallest statue of the world in the middle of the Narmada riverbed of Gujarat on 31st October, 2013. 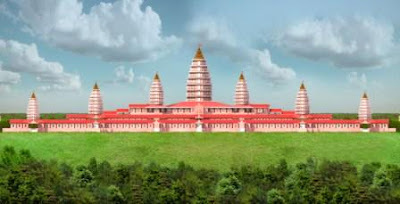 His competitor and Chief Minister of Bihar, Nitish Kumar has unveiled the model of the tallest temple to be constructed at Janakinagar of West Champaran district on 13th November, 2013. However, in comparison to height and costs of the proposals, Modi is far ahead of Nitish Kumar. While the proposed "Statue of Unity" is 240 metre tall ( including 58 metre pedestal ) the "Virat Ramayana Temple" will be only 122 metre in height. Estimated temple construction cost, Rs.350 crore (USD 55555500 ), is also less than 1/7th of the entire project cost of the statue of the 'Iron Man of India,' Sardar Vallabhbhai Patel. But, Nitish seems to be more clean in at least one count. His temple project, according to sources, will not displace anyone while the 'Statue Project' of Modi will require resettlement of 38,000 families, sources said. When the battle for the next Lok Sabha election is hotting up, it appears that, some national players are trying their best to draw attention of common people in the name of national unity and social harmony. Nationalistic feeling and religious beliefs of Indians are being exploited up to the hilt. Instead of announcing action plans against poverty, unemployment, price-rise and other pressing issues for national debate, politicians are busy playing with ethos of people for their own political gain.